Let’s be clear, this is a fan film. 20 odd minutes of dubious acting filmed on location at renfaire, the beach, and the woods with questionable dialogue featuring pirate accents of varying skill and consistency. And ninjas, lots and lots of time-traveling ninjas. Oh, and a sea hag who I think gave the ninja sea herpes or something like that. SPOILER ALERT – that last sentence contained a spoiler. Not only is this a film made by pirate fans, but it’s also most definitely a film FOR pirate fans. Reason being, the cast is a virtual who’s who of the southern California pirate scene. Aside from the primary roles filled by Oderless Eye and Captain Syn, supporting cast includes Michael Lampe (co-captain of No Quarter Given), Mad Eye Mitch (organizer of Pyrates Daze), Mad Davy Flynt (Silversmith to the Stars), and many others. And if you note that one of your favorite’s isn’t represented, you can always assume they’re disguised as one of the ninjas. Some pirate films are better when you’re drunk, and others make you feel like you already are. Treachery and a Dead Man’s Promise has the distinction of being both. Check it out for an oddly piratey (and ninja-y) time. 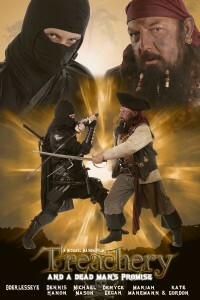 This entry was posted in Movies / TV and tagged ninjas, oderless eye, pirates vs. ninjas by Bilgemunky. Bookmark the permalink. Eye would love nothing more than to do a sequel to this fan film. More over ~ see other pirate enthusiast put forth thar own effort and make thar own movie / “Fan Film” rather than sitting back, letting Disney tell us Pirates wot for and how pirates should be portrayed. It be me pleasure to contribute to the pirate community in this way… Buy the Movie! Thank you Bilge for your review and taking the time to enjoy the movie. Bilge… You are so cool mate. Thankee for the kind words sir. Thanks to EyE the writer, producer & moneyman, and Michael M. film maker. We had a great time In So Cal working on it. This could very well become our all-time favorite movie quote.